I know you visited my blog from time to time, so I also just wanted to let you know that it’s shifted its focus a bit. I’m now focusing on gathering great, interesting articles and news stories while leaving behind all the negativity, politics, and gossip you see on most news sources. There’s a lot of interesting historical and scientific content, which I hope homeschoolers and educators will find useful. If you’d like to take a look, the link is in my name. I’d love to hear your thoughts on the new direction. Wow, great materials. I can’t wait to use them. Thanks for your hard work!! I love this. 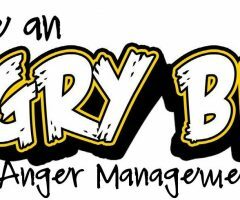 What a clever and fun way to talk about anger management! Thank you! What a clever and fun way to talk about anger management. Thank you! Let me know how it works with your son! I am a Psychologist at St. Jude Children’s Research Hospital. We have an event coming up for Children’s Mental Health Awareness Week, and our theme this year is Angry Birds. I was hoping to talk with you and see if you would feel comfortable for us to use these materials with our patients who attend the activity day. Please contact me by email. Thank you again for sharing this!! I have used your first post of angry birds anger management with my social skills group. I posted a reply to your last blog post! 🙂 I have been continuing to use it and I was so excited to see those visuals you made. I had made my own, but yours are way cuter!! I shrank the images and now my students can use them as visual reminders for their cool down strategies! I linked your blog to my post! Check out my most recent blog post about how I am incorporating this into my classroom. This is brilliant! I am in Ottawa, Canada and I would love to use this and pass it on… Don’t worry… you are given full credit. Could I translate it to French – I teach grade 2 French Immersion and I know my kids would understand it and would be able to put it into practice. LOVE THIS!!! And I love your new blog design, awesome!!!! Thanks so much for sharing! It is great! This is so creative! 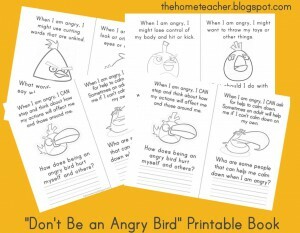 I teach Kinder and we are doing an angry birds unit next month! I could use this with my students…I will link up to you! I am so thankful for this lesson! I am using it with the students this week…THANKS SO MUCH!! They so far love it! This is awesome! My three boys love angry birds and we are having issues with anger and I’m not sure how to help them. This is perfect. Thank you so much! This is a very creative tool. Are there any copyright issues to be concerned about when using these materials? This is a great idea! I know the children will love it and get so much out of it! This is amazing! I love your book and they way you’ve made the whole process of working through anger and frustration more understandable for kids. Just love it! Thank you for sharing this! I absolutely love this idea! I am planning on implementing it this week! Can I just say that you are THE BOMB. 🙂 I have a student with explosive anger and this is so perfect!!!!! Thank you! I’m a school social worker and I will definitely use these with my students! This is fantastic! Thank-you so much for sharing this. This is awesome, I have a little boy in my room this year with big anger issues – this is really going to work for him! I teach 7th grade alternative education – will let you know how it goes, but I am SO GRATEFUL. Thank you so much! Some great ideas here, thanks for sharing! Wildly creative and applicable. Thanks! I have only just found my way to your site and have to say this is awesome, my little man is adopted and didn’t have the greatest start to life and sometimes his dark and grims get the better of him. This is something he really associates with and colouring it in and thinking about then writing his responses has mean’t he has taken the messages in more than if we just tell him for the 40,000 time – Thank you.. This is awesome! Thank you for providing these as FREE resources. This is AWESOME! Thank you for providing this as a free resource. these are fantastic! thank u so much! these are fantastic! thank u! My son is a kindergartener and not reacting well to frustration at school. “Don’t be an angry bird” really spoke to him. I am grateful that you were so creative to put this together. We were able to talk about his actions, break it down, and how to calm himself. It worked for him. One day he came home from school and said he picked up the lego he threw and found a bird’s nest. Thank you. I also wanted to add that we used your printable book and posters with two picture books – Cool Down and Work Through Anger by Cheri Meiners and I Just Don’t like the Sound of No! by Julia Cook. Again, I can’t thank you enough! 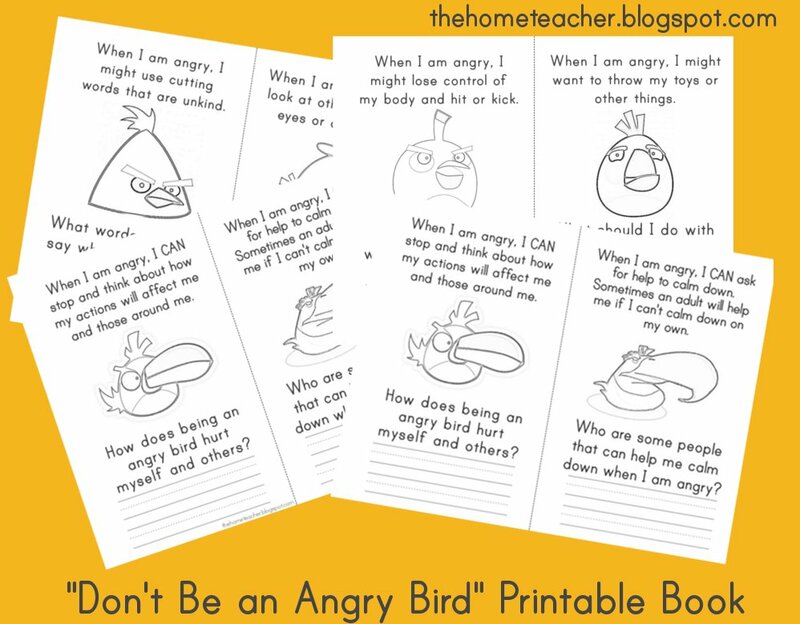 I was really looking forward to using the angry birds book for a social skills lesson, but I was not able to download it from the links on your page. Is the link still active? Would you be willing to send it? Thanks for your awesome ideas! I love this and cannot wait to use it. However, I cannot get the Cool Down Strategies poster to download. I just fixed the broken link! It should work now! I just came across this, and I’m really excited to utilize it with my four boys (under 7)! The 2nd “Cool Down Strategies” isn’t clickable. Is there anyway you can send that to me? These are amazing! I’ve used them in so many different settings. I’ve also been able to expand on them in my anger management groups. 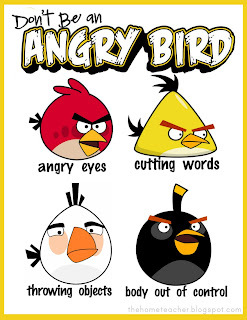 Since the kids love the angry birds, they are able to relate much better! Wow! This is great! I love this so much. 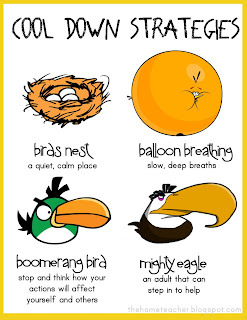 But nothing happens when I click on the “Cooling Down”, only the “Don’t Be an Angry Bird” one gets bigger. Is there any way you can fix this? Pretty please? 🙂 Thank you so much! Nevermind! I just saw it on your wiki site. Sorry! But thanks again. I can’t wait to use this. Haha well I am glad you were able to find it! But in case you need to access the file again, the image link is now working!! Is the printable book still available? I can’t print out the cool down strategies, and I would really love to! These are awesome and the video is perfect! Please send me the cool down strategies to print. The cool down strategy link is fixed! YAY! I am a school counselor K-5 and have 2 behavior groups of boys (k-2 & 3-5). They absolutely loved this activity and completely related to it. They begged me to let them color them, even the older boys. 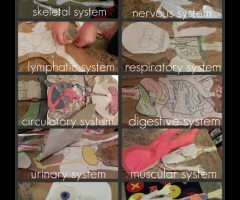 This is an awesome activity that I will use over and over! Thanks so much!! 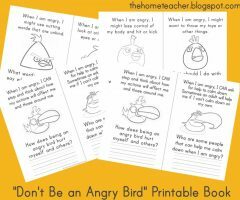 I like you Angry Bird story and resources. Would you please share the cut outs? I am compiling resources for my counselling kids portfolio. I didn’t use a pattern for the cut outs- just kinda eye balled it. Sorry! Thank you so much for this!! I am going to try use your method to help some of the students I am going to provide counseling with. Thank you for sharing all your wonderful resources! This is wonderful and I am going to start using it with my children! 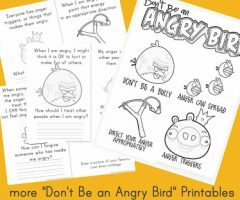 I am not able to find where to download your angry birds printables. Please help! Thank you SO MUCH for this! After much searching, I finally found this to use as an object lesson with 2nd, 4th, and 6th graders in our Bible Club tonight. We are talking about conflict resolution and I can adapt this very easily. We always try to use an object lesson or something they can relate to. This is it!! Planning on using this for church this weekend. Thanks for the great resource!